Nutritional disorder – potassium (K) deficiency. 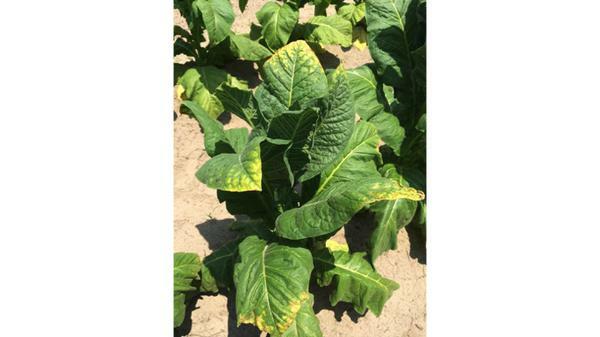 Potassium deficiency symptoms begin as a mild chlorosis and mottling of the leaf margin. Since potassium is vital to leaf expansion, the edge of the foliage curls in and downward, resulting in an umbrella like shape (Figure 1). 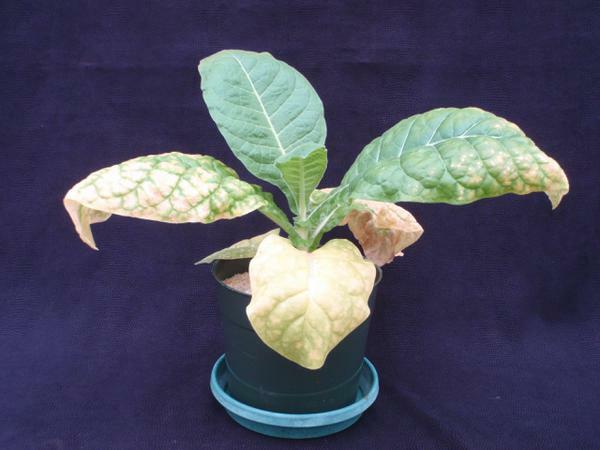 In addition to marginal interveinal chlorosis, mottling, and leaf deformation, a potassium stressed plant exhibits a general stunting of growth (Figure 2). 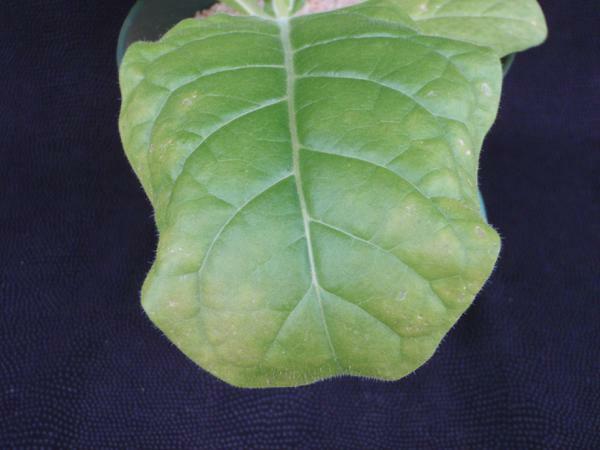 As K starvation continues, interveinal chlorosis and mottling will advance from the leaf margin moving toward the center. As symptoms progress, the marginal spots will expand in size and eventually become necrotic (Figure 3). When tobacco experiences a severe potassium deficiency, “firing” symptoms will appear. This unique and fascinating indicator appears as extremely chlorotic or even blanched foliage that is brittle in texture and appearance (Figure 4). The fired leaves may experience loss of leaf tissue as the brittle, necrotic tissue breaks away. As potassium deficiency persists, the symptoms will continue up the plant into the next level of foliage. Photographs of tobacco plants in the field are exhibited in Figure 6, Figure 7, Figure 8 and Figure 9. Figure 1. Initial K deficiency in the lower foliage, note the umbrella shape of the leaf margin. Figure 2. 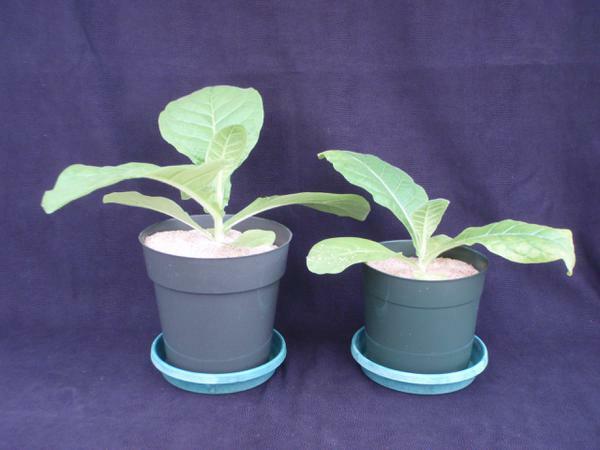 A healthy tobacco plant on the left as compared to a K deficient plant on the right. Figure 3. Intermediate K deficiency, note the marginal necrotic spots and advancing interveinal chlorosis. Figure 4. Firing of the lower leaves, note progression of symptomology (firing and blanching, sever chlorosis and necrosis of the margin, and beginning yellowing of the leaf margin) as it moves up the plant. Figure 5. The 360-degree view of this symptomatic plant with a severe potassium deficiency may be viewed by clicking on the above picture. Figure 7. Field view of potassium deficiency. Figure 6. Field view of potassium deficiency. Figure 8. Field view of potassium deficiency. Figure 9. Field view of potassium deficiency. Magnesium (Mg) deficiency also results in lower leaf symptoms, but in the case of limited magnesium, the leaves have a more distinct and fine interveinal chlorosis pattern and necrotic spotting takes longer to appear, as compared to a potassium deficiency. Tissue analysis for nutritional concentrations can assist with a correct diagnosis. Potassium deficiency is promoted by extreme environmental conditions such as hot, dry weather or excessive rainfall. During periods of drought, moisture within the profile is too low to facilitate the movement of potassium to the rooting zone. Alternatively, if excessive rainfall has been experienced, then potassium may have been leached below the rooting zone. Furthermore, it is not uncommon to observe mild potassium deficiency in ideal growing season. More specifically, the deficiency is most commonly observed at or very near topping, as nutrient demand is greatest at this stage of growth. As plants begin to flower, root growth is slowed and nutrients are portioned into leaf, flower, and seed growth. In many cases, the area of the soil immediately surrounding the roots becomes depleted of nutrients and cannot support demand expressed by the vegetation. This issue is often temporary and will typically be relieved as plants are topped, inducing additional root growth occurs, and allowing for additional uptake of potassium. 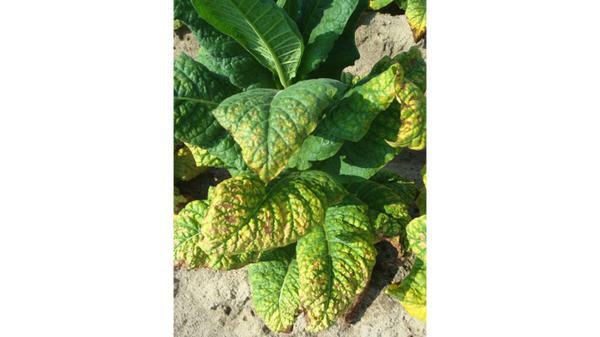 Stunted growth and lower leaf chlorosis and necrosis helps to distinguish this disorder from magnesium deficiency. Submit a leaf sample for nutrient analysis. Burley. 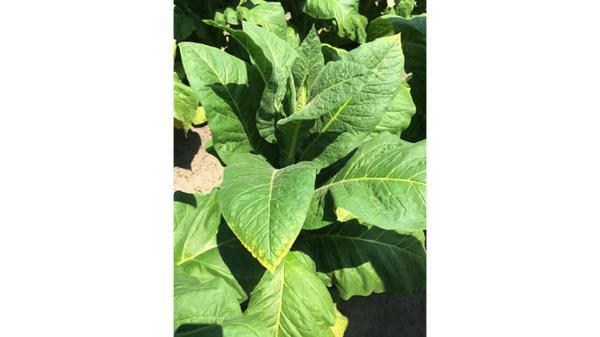 The potassium sufficiency range for burley tobacco varies with growth stage, but the overall trend is with higher levels in young plants as compared with mature plants. The ranges based on the most recently mature leaves are: seedlings (3.0 to 4.0%), early growth (2.5 to 3.5%), flowering (2.5 to 3.5%) and maturity (2.5 to 3.5%). Flue-Cured. The recommended potassium ranges for flue-cured tobacco are more refined. The ranges based on the most recently mature leaves are: seedlings (3.0 to 4.0%), early growth (2.5 to 3.5%), flowering (2.5 to 3.5%) and maturity (1.6 to 3.0%). At harvest, sufficiency ranges for nitrogen are available for the upper leaf (1.5 to 2.5%), middle leaf (1.5 to 2.5%) and lower leaf (1.3 to 2.5%). Tobacco is a luxury consumer of potassium; therefore, there are no published recommendations for excessive potassium levels, but excess potassium is known to limit the ability of the plant to uptake calcium and magnesium. Corrective measures to address potassium deficiency are difficult to perform as the crop approaches the topping stage of growth. Producers should monitor plants for signs of nutrient stress and make corrective applications based on rainfall prior to or at layby through a sidedress application. After layby the sidedress application is nearly impossible to accomplish due to advanced crop growth. At this point, potassium based fertilizers will have to be broadcast applied overtop. Typically 100 to 150 pounds of 0-0-22 (Sul-Po-Mag) or 0-0-50 (Sulfate of Potash) is sufficient, though 0-0-22 might be preferred if magnesium (Mg) is of concern as well. In fields with deep, sandy topsoils, potassium can be split applied with half the full rate being applied after transplanting and half the full rate being applied at layby to prevent excessive nutrient loss. Recent research has indicated that this method is as effective as applying all potassium after transplanting and could mitigate potassium losses in specific environments. 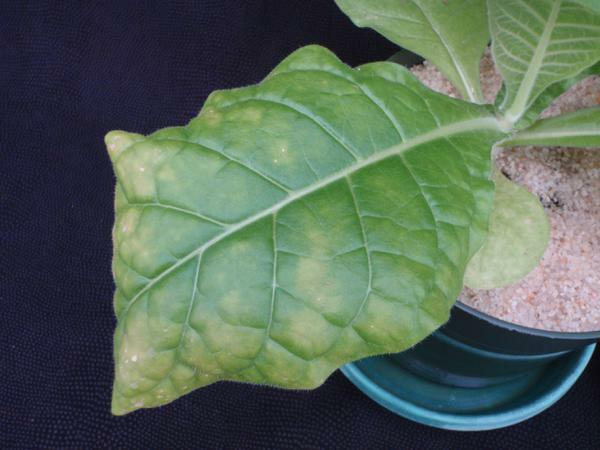 Foliar applications of potassium based liquid fertilizers are discouraged as the rates required to adequately feed tobacco will likely result in severe soluble salts injury. Seedling Production. Potassium is typically applied at a 1:1 ratio with nitrogen in the float system; therefore, deficiencies are extremely rare when N-P-K fertilizer sources (such as 16-5-16 or 20-10-20) are used. If potassium deficiency is observed, 75-100 ppm potassium from a water soluble potassium sulfate (such as 0-0-52) should be sufficient until application of an N-P-K fertilizer source is delivered. of more abundant soil sources and excessive application. Also, subsoils in tobacco fields often contain substantial amounts of potassium and other leachable nutrients that are seldom measured by soil tests because only topsoils are usually sampled. These results provide additional evidence that application of several leachable nutrients above soil test recommendations usually does not improve tobacco yield and quality, but does increase production costs. In addition, overapplication increases the potential for these nutrients to reach our ponds and streams by soil and water movement. 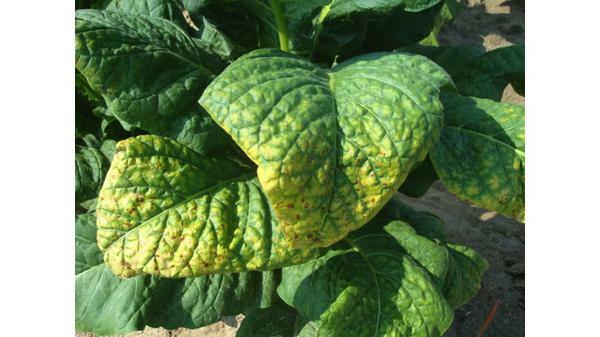 Potassium has long been overapplied due to relatively low material cost and the affinity the tobacco plant has for the nutrient. However, it is likely that producers can reduce total potassium input by as much as 10 to 20 percent without reducing leaf yield or quality. Recent research efforts focused on potassium nutrition indicate that as little as 75 pounds of K2O per acre is sufficient for soils with medium to high potassium indices, medium to fine texture, and less than 10 inches to clay. For example, while these specific soil conditions might be more common in the Piedmont than the Coastal Plain region of North Carolina, the overall message is still valid: potassium rates can be reduced without having a negative impact on crop growth/development. In areas marked by deep, sandy soil types, a split application of potassium (half the full rate after transplanting and half the full rate at layby) can mitigate some of the risk associated with excessive rainfall and nutrient loss.